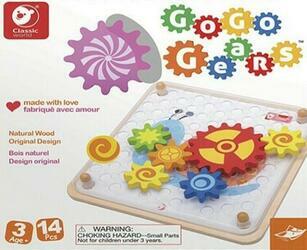 Let your imagination run wild with Go Go Go Gears™! Have fun by placing the coloured gears on the grid and observing their movements. The game includes 7 different gears and 10 visual examples of initiation. Use your imagination to create your own colourful kaleidoscopes! Easy to handle, Go Go Go Gears™ develops creativity, dexterity and understanding of simple gear mechanics for children aged 3 and over. Contents of the box : 1 board, 7 gears, 1 rule booklet containing 14 logical challenges.